When the Ukrainian government under then-president Viktor Yanukovych refused to sign the agreement in late 2013, it sparked Euromaidan protests, which resulted in Yanukovych’s escape to Russia. Moscow’s punishment of Ukraine’s pro-EU choice was severe: it annexed Crimea and ignited war in Donbas. Despite daily human tragedies, related to the war, this only strengthened Ukraine’s European hopes. The agreement is, certainly, one of the most EU-inspired instruments of Ukrainian change. It opens up room for deep reforms, integrates Ukraine into the European single market, and provides for implementation of EU product safety and quality inside Ukraine itself. However, despite its positive aspects, the deal continues to raise questions in Ukrainian society. First, it does not clearly mention EU membership as a goal and final end of the process. It only says ‘maybe’. Second, the AA is explicit about liberal economic agenda – free trade, removal of barriers, regulatory approximation. But on other important issues – tackling growing inequality and poverty, modernisation of the pension system or healthcare – its voice is weak. However, the story of contemporary Europe, which was built after World War II not only as a liberal space, but also as welfare systems, shows that liberal agenda is important but not enough. It is not enough to open up societies and economies; it is also important to think about citizens’ welfare. Ukraine, similarly to most member states, should now urgently think about this too. Over the past years it is facing increasing poverty and, as result, populism. The situation is worsened by the increasing development gap between Ukraine and neighbouring EU member states. The EU response to inequality – cohesion policy – is almost absent in the Association Agreement. This is understandable: the EU-Ukraine deal is not about social policy, as this domain remains mainly under competence of member states. On the other hand, a lot can be achieved through reforms envisaged by the agreement: they can improve the business climate, open up markets, and boost growth. These tools, however, are indirect and not always clearly visible. The Association Agreement is rule-setter, but it is not a panacea, especially if your goal is to improve the welfare of your citizens. Today EU-Ukraine dialogue is often falling into the trap of talking too much about membership prospects (still remote for Ukraine). This sometimes creates a deadlock. Why? Because for today’s Ukrainian citizens the prospect of EU membership often becomes a synonym for social cohesion. Membership of the EU becomes a symbol of better quality of life and welfare. If this prospect is too far, a Ukrainian citizen will face a question if his or her life will improve tomorrow. It is important that the next stage in EU-Ukraine relations keep this question always in mind. There should be, therefore, more effort made to achieve greater social, economic and infrastructure cohesion between Ukraine and the EU. There should also be a way to translate reforms driven by the agreement into tangible benefits for people. In a situation when EU membership remains a remote goal, EU and Ukraine can pursue a strategy of regular small steps that bring tangible results. Ideally, every year should see these small steps announced or implemented. 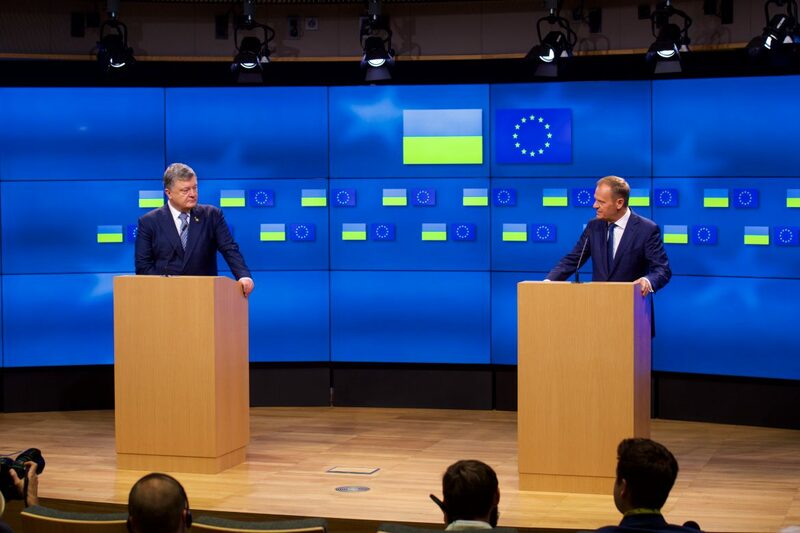 This would show that EU-Ukraine relations are not only a routine in AA implementation, but something more dynamic. The indicative list of steps that we propose is structured in three dimensions. The existing legal framework allow us to achieve the full participation of Ukraine in selected areas of the single market, particularly aviation, energy, digital market and e-commerce. Greater attention to consumer rights and benefits in the EU policies can be extended to Ukrainian consumers too. Second, economic and industrial cohesion aimed at reducing disparities in the level of development between Ukraine and neighbouring EU member states. These initiatives may include more infrastructure projects (key focus on roads and transport); joint job-creating industrial or technology projects (industrial clusters, technology parks, etc.). An EU-Ukraine fund promoting EU-Ukraine business contacts at the SME level can be created on top of existing EU4Business programme. Third, more investment in people through an enhanced education cooperation (for example, creating an Eastern Partnership university in Ukraine proposing teaching in English); enlarging EU cultural programs (like media) to Ukrainian audiovisual producers (cinema, music etc); better engagement of Ukrainian stakeholders in EU programs (Erasmus+, Creative Europe, Horizon 2020, etc.) enabling them to be grant holders. The key message of these proposals is not about funds or budgets. We are calling, instead, to have greater attention to the level of European integration visible for ordinary Ukrainians. This strategy of regular small concrete steps can make EU-Ukraine rapprochement tangible for people, year after year and month after month. They can be additional fuel for driving EU-Ukraine relations. A Ukrainian expert in EU law, a former member of the Ukrainian negotiating team on the EU-Ukraine Association Agreement, and strategic advisor at the International Renaissance Foundation; a journalist at Internews Ukraine and UkraineWorld.